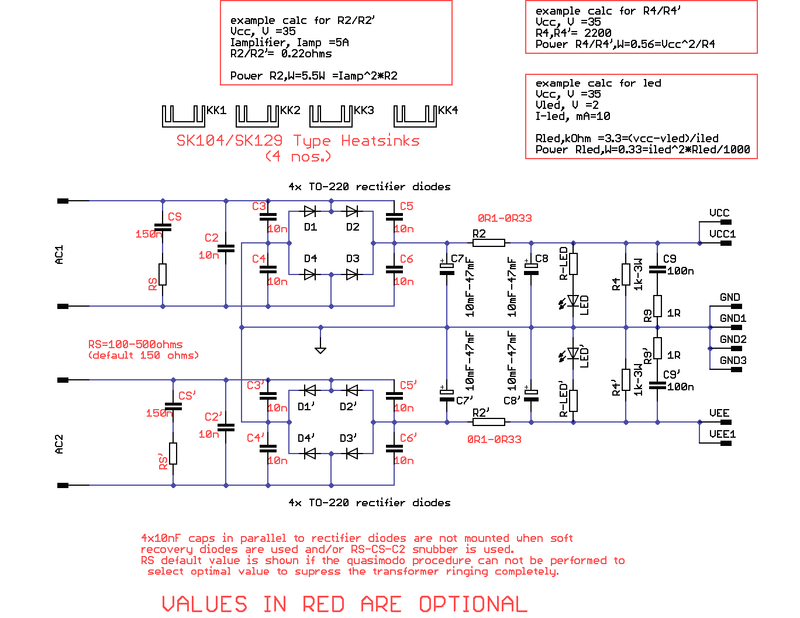 Following the realization of several people of a class A amplifier (USSA-5 of Fab), I decided to draw a PCB dedicated especially to this one but that can be suitable for any other amplifier. I wanted to do something fairly universal and practical and I told myself that this PCB might interest more people. Possibility to put four capacitors up to diameter 40mm. Possibility to put diodes (to220) soft or high recovery (capacitors provided). Capacitors in parallel on the inputs of the diode bridges. Possibility of putting an 'RC snubber' on the inputs of the diode bridges. Possible resistances between capacitors from 5W to 10W. The latest version brings the possibility to put 5-legged capacitors and TO247 box diodes. Last edited by Project16; 29th June 2018 at 07:23 AM. I like it, can you ballpark the price? For the price, everything will depend on the number of people interested. Currently there is a demand for eight PCBs. I will have the actual price at the end of the purchase group according to the number of people and confirmation will be made at this time. Put me down for 4 please. You can follow the other buying group on Quebec Diy. Currently we are 14 to 18 board. I keep you informed of the progress and I hope that others will join you in bringing down the cost price. what tickness is the board? Color? I would prefer 2oz, 2mm+ tickness, black, blue or red.White solder mask. Alternativ c-c-r-c-c with no diode section. Only request is 2mm+ thickness as per gwrskien and 2oz. Indifferent regarding color. There used to be a time, when penguins filled the sky! I`m in for 10pc, maybe more once the specs are set.